What made the experience of listening to Ten Lessons to Transform Your Marriage the most enjoyable? The book uses real life scenarios of couples they've had in counseling, which makes the suggestions relative to myself and my own situation. This book opened my eyes and gave me an outside perspective on how I communicate in my marriage, and even in past relationships. 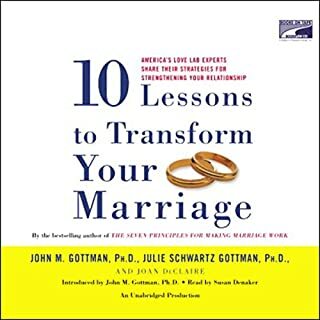 What insight do you think you’ll apply from Ten Lessons to Transform Your Marriage? Like I said above, this book is an eye opener. I've seen myself in the couples they have in this book, that gives me a new perspective, and will help me focus on getting to the heart of my needs, while allowing me to work on listening to the needs of my partner. Then we can work on fulfilling those needs together. I would recommend this book to anyone who is having communication breakdown in their marriage. There are numerous types of communication breakdown that are reviewed in this book, and they do a great job of doing a "before and after" session of these conversations. I plan on listening again to the book in its entirety, to get into more details.